Waynesboro is an independent city in the state of Virginia. In 2010, the census counted the population at 21,006. The area is surrounded by Augusta County and covers about 15.4 square miles. Waynesboro is part of the Shenandoah Valley where many significant historical markers of the Civil War were constructed. It is part of the Shenandoah National Park. The Blue Ridge Parkway, Skyline Drive, and Appalachian Trail are just a few miles away. In nearby Charlottesville, Cavalier Window Cleaning & Power Washing services are available to the area. At Cavalier, we dedicate ourselves to helping local homeowners and commercial property owners keep the exterior of their buildings clean and stain free. Our team of professional pressure washers are licensed and bonded for your safety. We have served our area for more than a decade and have worked hard to maintain our good reputation. Our expert team is comprised of window cleaners and power washing specialists who have years of industry experience. If you want a safe but thorough clean, we’re the servicemen and women that can help you. Our window cleaning service team believes that there’s times when a good, old fashioned hand cleaning is the way to go. This is especially true on surfaces that are delicate and vulnerable to other cleaning techniques. We use only safe, environmentally friendly product and will give your windows a clean and shiny appearance that will last. There’s no point in having to look through dirty windows any longer. We want you to enjoy those beautiful Virginia views once again. Different surface types require different approaches when it comes to cleaning them. Our power washing services include techniques that are best suited to the material. Full-forced pressure washing is best for cleaning concrete stains, gum, oil stains, and more on concrete or asphalt surfaces. Soft-washing is often used for roof tops, siding, and windows. Older surfaces like stucco or old brick require special care. With our professionals, you never have to worry that your home or commercial property is in danger of getting damaged when cleaned. Let us discuss your options with you and you’ll soon find out that we can provide you with knowledgeable advice for your exterior cleaning. We also handle garage floor and basement floor cleaning. If your siding has seen better days, a good professional cleaning can really brighten it up. With the weather patterns in our area of Virginia, humidity can really help algae to grow. Once mold or algae take root, it’s very difficult to get rid of permanently, but our team of experts is no match for this ugly contaminant. We’ll safely and effectively clean your siding so you don’t have to worry about being safe in your home or business. With a proper clean, your siding can look new once again! 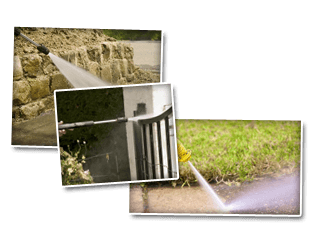 If you are looking for Power Washing Services in Waynesboro, please call 434-823-1737 or 540-910-1434 or complete our online request form.